You can either create a task involving your customer, or an internal task for your employees. 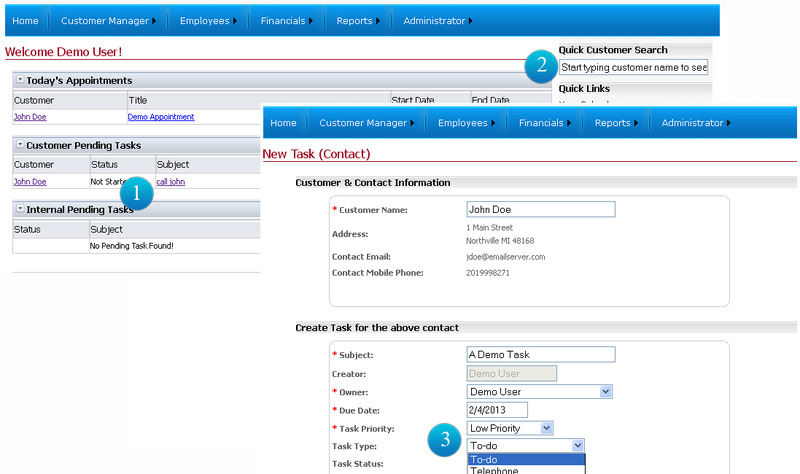 All task will appear in users' home page as shown. From home page, user can access customer by simply typing in the customer name, that will trigger a search and will take you to the customer dashboard. All task created can be tracked using its various statuses, types (To-do, Telephone, visit a contact and so on), and priority (low, medium, or high). Web based software designed for Small Business Owners. smartofficeCloud ® is a GeoTrust secured product. A product of Evalon Inc.
Tell us about yourself, and we will be in touch right away. Thank you for taking the time to leave us feedback.